Today, we may be at a key inflection point for both the future direction of the U.S. dollar as well as market expectations for inflation. The US dollar, as measured by the US Dollar Index (DXY), is at the top of a trading range that has been in place since the start of this year (Chart 1). In fact, it is threatening to break out of the top of this range. A stronger US dollar has been linked to recent equity market volatility, in part because of the way that it destabilizes emerging market economies. Many EM countries have large amounts of USD-denominated debt, and a stronger US dollar makes it more expensive to pay back that debt and can lead to a debt crisis. The recent surge in the US dollar accelerated with the Fed's 9/26 statement and more hawkish tone. 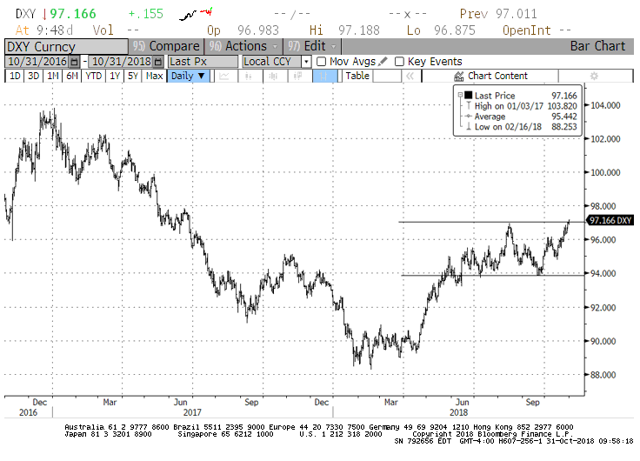 We believe if the dollar breaks through the trading range and accelerates, the return of optimism to the equity markets may prove short-lived. Inflation expectations, as measured by the breakeven on the 10-year Treasury Inflation Protected Security (TIPS), are the mirror image of the dollar's trading range. Since the 9/26 Fed announcement, inflation expectations have slumped and are now at the bottom of the trading range in place since early 2018. A rising US dollar is often disinflationary, making imports cheap. Not surprisingly, inflation expectations have fallen in recent weeks, along with stocks. Inflation is like the thermometer of the economy, taking measure of the pulse of the nation - when it falls too low, the patient is ill.
Why should equity investors care? We believe that if the US dollar breaks out, EM markets will again likely be under pressure and inflation expectations will slump. Slumping inflation expectations are also consistent with a poor outlook for the economy (lower stocks), lower tax revenues, and a much larger deficit. This turn of events would bode ill for risk assets. The markets are telling the Fed not to tighten any more, otherwise an equity market correction may turn into something worse. 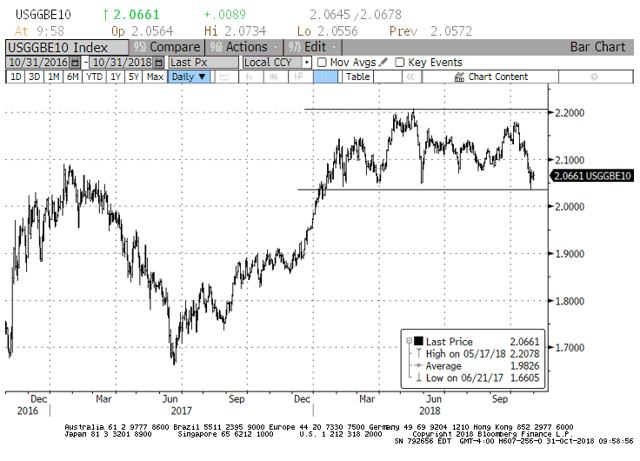 If these levels hold and inflation expectations stabilize, and the US dollar rally remains contained, and the Fed gets the message, 2019 could be a better year for risk assets. Past performance is not a guarantee of future results. Inherent in any investment is the potential for loss. This document is not intended as investment advice or a recommendation of any security or investment strategy for a specific recipient. Investments or strategies described herein are provided as general market commentary, and there may be no account or fund managed by Fiera Capital Inc. for which investments or strategies described herein are suitable due to the various types of accounts or funds that are managed by Fiera Capital Inc. Nothing herein constitutes an offer to sell, or a solicitation of an offer to purchase, any securities, nor does it constitute an endorsement with respect to any investment area or vehicle. This material cannot not to be reproduced or redistributed without the prior written consent of Fiera Capital Inc.
Certain information contained in this document may constitute "forward-looking statements," which can be identified by the use of forward-looking terminology such as "may," "will," "should," "expect," anticipate," "project," "estimate," "intend" "continue," or "believe" or the negatives thereof or other variations thereon or comparable terminology. Due to various risks and uncertainties, actual events or results or the actual performance of any strategy or market sector may differ materially from those reflected or contemplated in such forward-looking statements. Statements regarding current conditions, trends or expectations in connection with the financial markets or the global economy are based on subjective viewpoints and may be incorrect. The information provided is proprietary to Fiera Capital Inc. and it reflects Fiera Capital Inc.'s views as of the date of this document. Such views are subject to change at any point without notice. Some of the information provided herein is from third party sources and/or compiled internally based on internal and/or external sources and are believed to be reliable at the time of production but such information is not guaranteed for accuracy or completeness and was not independently verified. Fiera Capital Inc. is not responsible for any errors arising in connection with the preparation of the data provided herein. No representation, warranty, or undertaking, express or implied, is given as to the accuracy or completeness of such information by Fiera Capital Inc. or any other person; no reliance may be placed for any purpose on such information; and no liability is accepted by any person for the accuracy and completeness of any such information. Any charts, graphs, and descriptions of investment and market history and performance contained herein are not a representation that such history or performance will continue in the future or that any investment scenario or performance will even be similar to such chart, graph or description. Any charts and graphs contained herein are provided as illustrations only and are not intended to be used to assist the recipient in determining which securities to buy or sell, or when to buy or sell securities. Any investment described herein is an example only and is not a representation that the same or even similar investment scenario will arise in the future, or that investments made will be as profitable as such examples or will not result in a loss to any such investment vehicles. All returns are purely historical and are no indication of future performance.